What happens when one of Hollywood’s most successful and well-loved filmmakers sign a content deal with a world-conquering consumer tech giant? 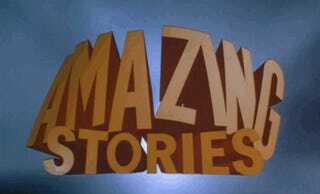 In the case of Steven Spielberg and Apple, you apparently get the revival of the director’s long-dormant genre anthology show Amazing Stories. Let’s hope they keep that John Williams theme. If you’re an ‘80s baby, you might remember Amazing Stories as falling in line with the TV tradition embodied by The Twilight Zone and The Outer Limits. Both classic TV series told sharp, done-in-one stories that had actors moving through sci-fi, horror and thriller genre plots. The success of shows like Channel Zero and Black Mirror might mean that it’s the right time for Amazing Stories to come back. Will the Cavemen Get iPhones Now?